New treasury regulations proposed by the Internal Revenue Service on October 31 significantly diminish the sting of Section 956 for many US corporations that own stock in non-US corporations that have investments in US property. As an increasing number of jurisdictions have entered into intergovernmental agreements related to FATCA or agreed to mandate compliance with the OECD common reporting standard, exempt organizations are being asked to classify themselves in subscription agreements and forms provided to the investment vehicles. On February 9, President Trump signed into law the Bipartisan Budget Act of 2018 which retroactively extended some temporary tax breaks and includes some additional provisions which were left out of the Tax Cuts and Jobs Act of 2017. Under 1991 US guidance, if a non-US partner sold its interest in a US partnership, the selling partner would look through to the business of the partnership and would be required to file a US tax return and pay US tax if the partnership would have had income effectively connected to a US trade or business on a deemed sale of its assets. But that guidance was reversed in a tax court case. Then the US position was reversed again in the Tax Cuts and Jobs Act. For non-US individuals and corporations that invest in real estate within the US, the rules that subject their gains to US federal income tax generally are found under Section 897. The Foreign Investment in Real Property Tax Act rules have often been attacked as a disincentive for overseas investors to enter the US real estate market. This article describes the impact of the Tax Cuts and Jobs Act on securitization transactions. The article addresses in detail the new limitation on the deduction for business interest expense as well as the requirement that the transferee of an equity interest in a partnership engaged in a US trade or business withhold 10% of the amount realized unless the transferor certifies that it is a US person. Although recent legislation commonly referred to as the Tax Cuts and Jobs Act retained Section 956 of the Internal Revenue Code (and its notorious deemed dividend issue), the enactment of other changes may reduce the impact of Section 956 on taxpayers. On December 22, 2017, President Trump signed into law the most sweeping tax law changes in the last thirty years. Highlights of the new tax reform legislation as they impact individuals are summarized in this Client Alert. Overlooked in the many discussions about the new tax laws are the consequences on trusts and estates and the high likelihood trusts and their beneficiaries will see larger income tax bills for the next seven years. This Client Alert focuses on how the tax changes will impact trusts and estates, identify some of the significant uncertainties and provide recommendations for fiduciaries. On December 15, House and Senate conferees reached an agreement on the Tax Cut and Jobs Act and released the final version of the Bill, which is expected to be voted on this week in the House and Senate. Both the House and Senate versions of the Tax Cuts and Jobs Act include a new provision that would impose an excise tax on the compensation paid by certain tax-exempt organizations if the compensation to a covered employee is more than $1 million. On November 2, Representative Brady released the “Tax Cuts and Jobs Act.” On November 9, the Senate Finance Committee released a “Description of the Chairman’s Mark of the ‘Tax Cuts and Jobs Act.’” This summary highlights four provisions in the proposed legislation that will be of particular interest to financial institutions. On November 2, Representative Kevin Brady released the proposed text of the long-awaited federal income tax reform bill. The bill also includes a provision that creates a limit on the deductibility of interest. If enacted, this provision could have potentially wide-reaching impacts on securitization transactions. On November 2, Representative Brady released the proposed text of the long-awaited federal income tax reform bill. If enacted into law, the bill would eliminate all tax-exempt private activity bonds, tax credit bonds and all tax-exempt advance refunding bonds. The United States Treasury Department has withdrawn proposed regulations dealing with the definition of “political subdivisions” for purposes of the tax-exempt bond provisions of the federal tax law. Political subdivisions are divisions of state or local governmental units that can issue federally tax-exempt bonds. In an environment of growing global mobility of many families and heightened regulatory and compliance pressures, many U.S. estate planning advisors are encountering international issues for their clients with increasing frequency. In September, the IRS released proposed regulations that would not only change the types of instruments that are registration-required obligations, but also clarify when a registration-required obligation meets the requirements to be treated as issued in registered form. The recently released “Unified Framework for Fixing Our Broken Tax Code” includes a proposed limitation on the deductibility of interest expense by corporations. Although this framework does not provide details as to the nature or scope of the proposed limitations, any such limitations will potentially affect the balance in preferences between debt and equity funding. The American Bar Association’s Section of Taxation submitted a white paper on the history of the tax-exemption of interest on state and local bonds to the Internal Revenue Service. The Tax Exempt and Government Entities Division of the Internal Revenue Service announced changes to the information document request process in tax-exempt bond and tax-advantaged bond examinations. On January 17, 2017, the Internal Revenue Service released new safe harbor guidelines for determining whether a management contract results in private business use of property for purposes of the federal income tax rules relating to tax-exempt bonds. On August 22, the Internal Revenue Service released new safe harbor guidelines for determining whether a management contract results in private business use of property for purposes of the federal income tax rules relating to tax-exempt bonds. 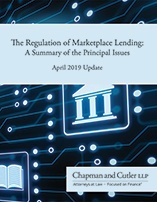 On July 18, the U.S. Treasury and the Internal Revenue Service published final arbitrage regulations that contain revisions to the tax-exempt bond regulations relating to, among other things, working capital financings. On April 4, the U.S. Treasury Secretary announced that the government would release regulations to curb inversions and reduce the ability of companies to avoid taxes through “earnings stripping;” those regulations were published in the Federal Register on April 8th. In December 2015, Congress passed the Protecting Americans from Tax Hikes Act of 2015, which extended certain federal renewable energy tax credits for projects that began construction prior to the dates set forth in the Path Act. In response to that extension, the IRS has issued additional guidance with respect to a renewable energy facility’s eligibility to receive these tax credits. The Internal Revenue Service recently released proposed regulations concerning the definition of a “political subdivision” for purposes of tax-exempt financing. On Oct. 27, 2015, the United States Treasury Department and the Internal Revenue Service published long-awaited final regulations that provide welcome guidance to 501(c)(3) health care organizations that are borrowers of qualified 501(c)(3) bonds. Recent changes to the tax law will require partnerships to pay tax at the partnership level on certain audit adjustments to partnership income, and these changes may affect government pension plans that invest in partnerships. On October 1, 2015, the Tax Exempt and Governmental Entities Division of the Internal Revenue Service released its Tax Exempt and Governmental Priorities for Fiscal Year 2016. The Internal Revenue Service Office of Tax Exempt Bonds has announced a new sequester reduction in amounts paid to issuers of direct pay bonds for which issuers elected to receive a direct payment from the U.S. Treasury pursuant to Section 6431 of the Internal Revenue Code. On May 20th, the IRS released draft updates to the U.S. Model Income Tax Convention. On June 8, 2015, Long Beach Community College District in California paid the Internal Revenue Service $1,013,000 as a result of the private activity use of certain real property acquired by the District with proceeds of tax-exempt certificates of participation issued in 2001. Private schools that are exempt from federal income taxation must file an annual information return with the IRS concerning their racial nondiscrimination policies. Schools that file the annual information return, Form 990, Return of Organization Exempt from Income Tax may satisfy this annual filing requirement on Schedule E.
Form 5578 is a half-page form simply certifying that a private school has complied with the racial nondiscrimination guidelines set forth by the Internal Revenue Service. The failure of a private school to annually file this form may jeopardize the school's tax-exempt status under Section 501(c)(3). On June 24, 2015, Prop. Treas. Reg. §1.148-1(f) addressing the definition of “Issue Price” was published in the Federal Register. The Internal Revenue Service is accepting comments on the Proposed Regulation through September 22, 2015. On January 13, 2015, the IRS published Notice 2015-4 to specify that the performance and quality standards applicable to small wind energy property intended to qualify for the investment tax credit are those established by the American Wind Energy Association or the International Electrotechnical Commission. On October 15th, the IRS proposed a change to the regulations which would eliminate the requirement of a creditor to report cancellation of debt income on Form 1099-C after not receiving payment for 36 months. On October 24, 2014, the IRS issued Notice 2014-67, Private Business Use of Tax-Exempt Bond Financed Facilities. Under the American Taxpayer Relief Act of 2012, qualified renewable energy generation facilities that began construction prior to January 1, 2014 are eligible to receive the renewable electricity production tax credit under section 45 of the Internal Revenue Code or, in lieu thereof, the energy investment tax credit under section 48 of the Code. On May 2, 2014, the IRS released Notice 2014-33, offering transitional relief for the enforcement and administration of FATCA. The following is a summary of certain proposed changes to the Real Estate Investment Trust provisions of the Internal Revenue Code included in recent legislative proposals. Legislative proposals by House Ways and Means Committee Chair Dave Camp would expand the scope of the unrelated business taxable income rules so that state and local pension funds would be subject to tax on certain investment income, including, in some instances, income from investment funds. Recently proposed legislation would generally (i) require sale treatment when a C corporation elects to become a regulated investment company or transfers assets to a RIC, (ii) treat certain RIC shares as United States real property interests subject to tax by non-U.S. persons on disposition, and (iii) provide that RIC dividends received through foreign corporations would not be eligible for a dividends received deduction. The Future of Individual Income Tax? The Tax Reform Act of 2014 intends to simplify and consolidate the individual taxation scheme by consolidating, changing, or eliminating a variety of current tax benefits and the tax rates. In March 2014, the U.S. Department of the Treasury released its general explanation of the tax proposals in the Obama administration’s proposed fiscal year 2015 budget. Federal income tax reform has been the subject of numerous congressional discussions and committee hearings over the last year. Legislative proposals by House Ways and Means Committee Chair Dave Camp would repeal the 4% LIHTC and change the way LIHTCs are allocated by the States. On February 26, 2014, Representative David Camp, chair of the House Ways and Means Committee, released draft legislation referred to as the Tax Reform Act of 2014 that proposes to amend major portions of the Internal Revenue Code to provide for comprehensive tax reform. Recent legislative tax reforms proposed by Senate Finance Committee Chairman Max Baucus could have far reaching tax and other economic consequences to many holders of interests in real estate and tangible personal property, whether as investors, lessors, or other business users. Pursuant to the American Taxpayer Relief Act of 2012, qualified facilities that begin construction before January 1, 2014 will be eligible to receive the renewable electricity production tax credit under section 45 of the Internal Revenue Code or, in lieu thereof, the energy investment tax credit under section 48 of the Code. The Internal Revenue Service recently released Notice 2012-44, which provides guidance concerning qualified energy conservation bonds. QECBs are taxable bonds that can be issued by state or local governments to finance certain energy conservation projects, including: (i) reducing energy consumption in publicly owned buildings by at least 20 percent; or (ii) implementing green community programs. QECBs may also be issued to finance certain electricity-producing facilities, such as wind facilities and solar facilities. The Internal Revenue Service recently released Notice 2012-44, which provides guidance concerning qualified energy conservation bonds. QECBs are taxable bonds that can be issued by State or local governments to finance certain energy conservation projects, including: (i) reducing energy consumption in publicly-owned buildings by at least 20 percent; and (ii) implementing green community programs. QECBs may also be issued to finance certain electricity-producing facilities, such as wind facilities and solar facilities.